The Shire of Pingelly builds and maintains roads and footpaths throughout the Shire. 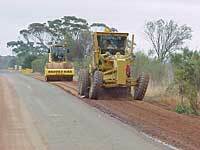 The Shire has 209km of sealed roads and 374km of unsealed roads in an area of 1,223 km2. While Council endeavours to complete all budgeted works, circumstances such as weather, plant breakdown and other unforeseen occurrences do not always allow this to happen.